In South Nahanni we are in the unique position to fly our clients not only with the usual bush planes, but also with our own helicopters, either a Bell 206 Jet Ranger or a Bell Longranger L1, which is stationed in base camp throughout the entire hunting season. The helicopter allows for a new dimension in game management as it enables us to concentrate on mature game. We have the freedom to pick our hunting locations carefully, and therefore don't need to return to easily accessible populations. Instead, we leave recently hunted areas to themselves for at least one year so that our game populations - each band of rams, moose habitat or herd of caribou - have time to renew themselves. This ensures you, the hunter, of excellent trophy choices, and us, the outfitters and guides, of providing honest trophy hunts in untouched wilderness forever - conservation close at heart. You still think we could easily overhunt our area? Try it. We don't take more hunters than before, when access was first on horseback and later with bush planes only. We hunt more diverse now than ever before. We actually use our entire concession versus just 1/5 of it. In effect, we now hunt less game per square mile, or hectare, than ever before. Why not take more hunters? Even if we wanted to, this would be an organizational feat that is not easily managed. And abuse? Any hunting method using aircraft can be exploited and abused. It is always the integrity of the hunter, the guide and the outfitter, which guarantees FAIR CHASE and clean hunting methods. 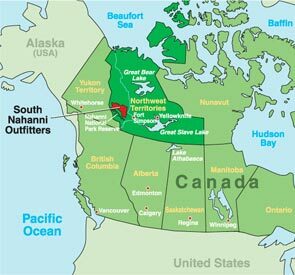 A government imposed 12-hour waiting period after every air lift with the helicopter (and plane) is strictly adhered to in South Nahanni. 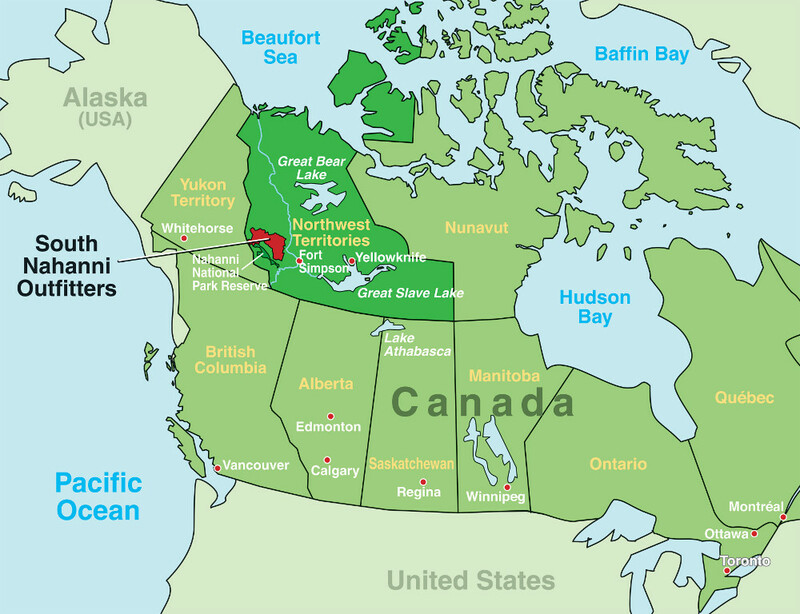 Hunting from the helicopter, with the helicopter or just disembarked from the helicopter is not possible in South Nahanni. And as game is fairly easily spooked by the helicopter noise, a discreet distance will be observed. The helicopter offers a higher comfort level for you, the hunter, as strenuous travelling into the actual hunting area is eliminated. You will not have to backpack your entire gear to your general hunting location. You will disembark from the helicopter and set up your spike camp right there, hunt from right there. Our guides, trusted professionals, carry satellite phones at all times. Once your game is harvested they will take proper care of trophy and meat, and will phone base camp where planes and helicopter are on standby, ensuring a fast and efficient all around service. On sheep hunts you and your meat will most likely be picked up in your spike camp location; on moose hunts the helicopter will sling out your moose directly from the kill site. Minimizing the carrying of meat results not only in higher comfort levels, but also insures that meat wastage is never an issue. A walk in cooler in base camp as well as freezer will take the best of care of your meat. Ensuring everybody's safety is always a major concern. We want to make your hunt fun, enjoyable and safe. And the helicopter accomplishes just that. Flying in poorer weather conditions as well as landing on gravel bars and mountain tops is always safer in a helicopter. Little bush plane strips in the wilderness can be more prone to problematic take offs and landings. The helicopter will hover and set you down neatly and safely. Being in the position to offer you helicopter transportation is unique in North America. It ensures game management, excellent trophy choices, the best tool for conservation, little hunting pressure at total accessibility, fast and efficient all around service, best care of trophies and meat, comfort and safety. Ride it!